California's Jerry Brown: Water Tunnel Shows 'I Want To Get [Stuff] Done' : The Two-Way Brown expressed his frustration with what's become an intractable problem by dropping a four-letter expletive. Gov. 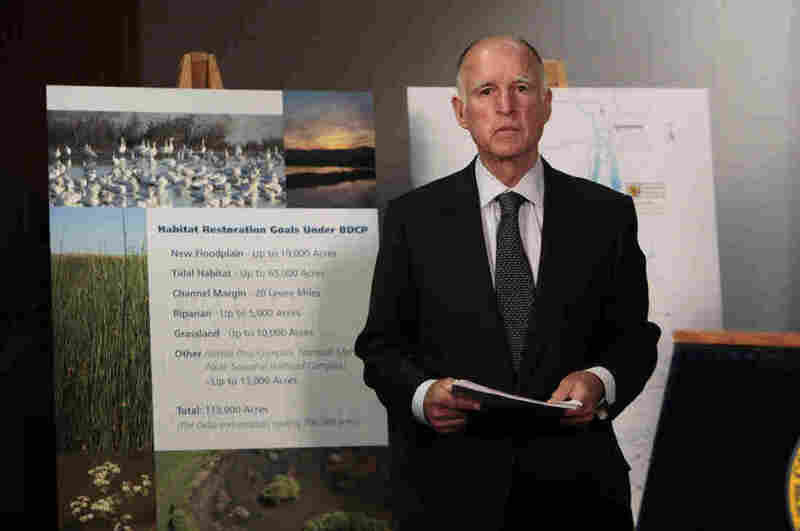 Jerry Brown waits for the start of a news conference to announce plans to build a giant twin tunnel system to move water from the Sacramento-San Joaquin River Delta to farmland and cities. Calif. Gov. Jerry Brown and U.S. Interior Secretary Ken Salazar announced a new $23.7 billion proposal that would build a twin tunnel system to carry water from the Sacramento-San Joaquin River Delta over to the southern part of the state. Water in Southern California has become an intractable problem. The frustration was evident at the press conference, when Brown dropped a four-letter expletive. "The Democratic governor has been seeking a way to move water through or around the Delta since he was governor before. He persuaded the Legislature three decades ago to approve a peripheral canal, but the measure was defeated in a referendum in 1982." Lauren Sommer reports on the history for today's edition of All Things Considered. She went to the delta with biologist Julio Adib-Samii who says the current pumps have contributed to the ecological damage of the delta. "Ten years ago, the Delta's fish populations crashed," Sommer reports. "Chinook salmon numbers went so low, the commercial fishery shut down for two years." Sommer added: "Federal wildlife agencies stepped in and said water pumping had to slow down during certain times of year to protect fish. That didn't go over well in certain parts of the state." Today's announcement is supposed to fix all of this. But the project is already facing some tough hurdles. "State officials admit they don't know just how much water would be diverted through the tunnels or how habitat restoration and decreased flows would affect the fish. They say these questions would be answered through scientific studies that accompany construction over the next 10-15 years. "Opponents argue it would devastate the delta region, including its ecosystem and agriculture-based economy. They say it's unacceptable to proceed with building the tunnels without knowing up front their impact on imperiled fish species such as salmon and smelt. Officials said the amount of water to be pumped would depend on what is good for the fish." We'll add audio of Sommer's piece to this post a little later on tonight.